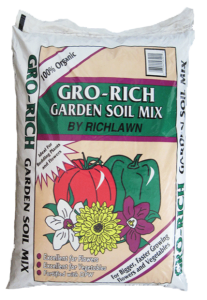 Gro-Rich Garden Soil Mix is the perfect soil to use when planting. It supplies the correct pH balance, necessary plant nutrients, while improving moisture retention, adding billions of beneficial micro organisms, and providing the optimum growing conditions for your plants. Gro-Rich Garden Soil Mix contains no harmful ingredients and is safe for pets and children.